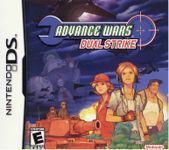 Advance Wars: Dual Strike is the first version for Nintendo DS of the popular Advance Wars Series. The game is developed by Intelligent Systems and released by Nintendo in 2005. AW:DS is like the other Advance Wars games a turn-based tactic war game. In Advance Wars each side battles the other using ground, air and naval units. These units can be purchased using money that is received based on the number of buildings controlled. The goal is to either wipe out all the enemy units or to capture the enemy base. In campaign mode there are many levels with variations on both the goal of a level as well as on the basic gameplay. - Campaign mode: A story driven series of levels. - War room: Battling against computer-controlled opponents. Options include the number of opponents (2, 3, 4 or Dual Front) and the use of skills. - Versus: Multi-player mode for up to 4 players. - Survival: Play a series of maps with one of three constraints: Number of turns, playing time or funds. Apart from that you can buy additional maps with earned points, collect 300 different medals for achieving certain goals and design your own levels and share them with other owners of the game. The game is very similar to the previous Advance War games, but it is well produced and very complete. - Skills: The possibility to choose certain skills per CO. The skills to choose from and the maximum number of skills usable per CO depend on the CO's rank. The rank goes up based on experience points. There are skills for increasing defence/offence, increase funding, lower production costs, etc. - Dual Front: Some battles takes place on two different fronts at the same time. - Tag Battle: The use of two CO's to command the troops (player can switch between CO's at the end of a turn).